Voting machine manufacturer ES&S has denied that its systems were ever equipped with remote-access software when confronted by reporters. But after receiving questions from a U.S. senator on the matter, the company has admitted it did do that dumb thing, but it did it a long time ago, and it doesn’t do it anymore. In March, Oregon Senator Ron Wyden’s office sent a letter to the executives at Election Systems & Software with questions regarding a New York Times Magazine report that claimed software had been installed on some of the company’s election-management systems (EMS) that allowed admins to access the machines remotely. “None of the employees who reviewed this response, including long-tenured employees, has any knowledge that our voting systems have ever been sold with remote-access software,” ES&S told the Times Magazine. The company’s machines were used statewide in a number of states, and at least 60 percent of ballots cast in the US in 2006 were tabulated on ES&S election-management systems. It’s not clear why ES&S would have only installed the software on the systems of “a small number of customers” and not all customers, unless other customers objected or had state laws preventing this. Wyden’s office supplied Gizmodo with the letter. In it, the company explains that even though guidelines established in 2005 require voting systems to be completely disconnected from the internet, ES&S waited until the 2007 deadline to comply. It wrote in the letter: “[R]emote connection software was used solely to enable effective and timely customer support and was considered an acceptable practice by numerous technology companies, including other voting system manufacturers.” The company also claimed it has “confirmed” that the EMS workstations in question no longer have this software installed. 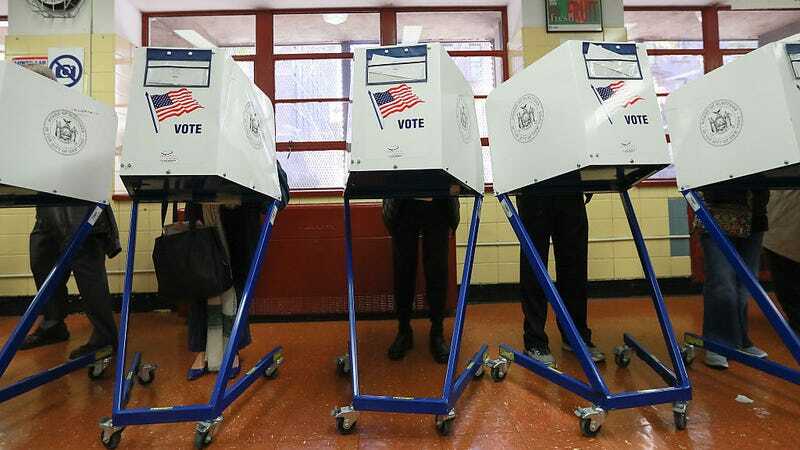 Since the 2007 deadline, federal guidelines have prohibited voting systems from being connected to an unsecured network, and they are only supposed to contain software that’s directly related to the actual process of voting. The EMS workstations in question are not the same as the machines used by voters at the polls; they serve various administrative functions like adding up the results and, in some cases, programming the digital voting booths. To put it simply, systems used for voting should not be remotely accessible by anyone. It simply provides a way in for hackers, and hackers always find a way in. As such, paper ballots are still the most secure option, but for various reasons, many counties don’t use them. This admission by ES&S should not cause some sort of panic or doubt in the integrity of our election system. The decentralized nature of the way we count votes is a helpful safeguard, and we haven’t seen evidence of vote tampering, but we still have a lot of improvements to make. But there’s still the question of why Americans should trust ES&S to provide its voting systems when it misled the American public about its past practices. We reached out to the company to ask why it previously denied having remote-access software on its voting systems. And we asked why it continued the obviously insecure practice until the moment the law required it to stop doing so. We did not receive an immediate reply. There also still lingering questions about the truth of its claim that none of its machines contain the software or a connection to the internet today. Motherboard and the Times Magazine cite numerous incidents since 2007 in which that appears not to be the case. And last year, Gizmodo reported that security researchers found the voter files of 1.8 million residents of Illinois on an unsecured server under ES&S’s control. It’s becoming quite clear that this isn’t the most responsible company in the industry, and this is really not a great time to be playing around with our election security.